Yeah, but: Some people actually like it. The Long Version: Lowepro makes many, many backpacks, ranging from the massive and expedition-worthy to this cross between a camera carrier and a child's book bag. 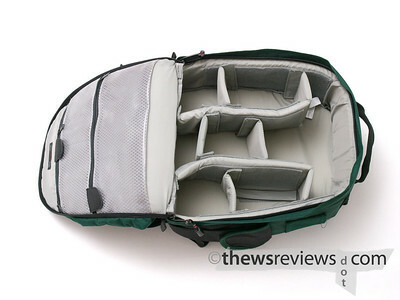 In September of 2007 I had an acute and decisive need for a camera backpack, and bought the MicroTrekker200. I thought that since I couldn't buy the one I love - Think Tank's Glass Taxi - I'd lug the one I was with. What you see in the photo above is how I load my MicroTrekker. On top is an Olympus E-510 with the 35-100 f/2, and on the bottom is the Olympus E-1 wearing the 7-14 f/4. The empty space is big enough to squeeze a really small lens, but nothing else. Lowepro's own description of this bag says it will carry "SLR with attached 80–200mm f/2.8 lens (most makes) plus 3 more lenses," so while my equipment is pushing it, it's not completely unreasonable. 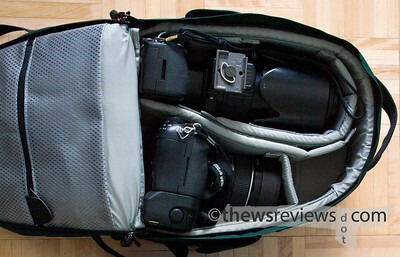 There are two different styles of camera bags: access bags and transporting bags. A bag that I'd choose for frequent access is a shoulder bag like the little Domke F6 or the larger Crumpler 6M$H, which carries just as much as the MicroTrekker. Backpacks are a poor choice when good access to the gear is essential, but they make up for it with the ease that they carry gear over long distances. And this is where the problem starts. Despite its diminutive dimensions, it's possible to pack some serious weight. The backpack is built very well and shows no signs of wear or distress, but the very thin and barely padded straps are not up to the task. To make matters worse, at six feet tall, I'm far larger than the smurf that this backpack is sized for and the straps cut into my shoulders no matter how I adjust the bag. After a typical day's shooting this bag leaves me sore and with large red welts from the straps. Granted, it solved the problem that I needed it to -- getting my camera gear safely on short-hop flights when I also needed to carry on a small duffel -- but now that I'm home I don't see its purpose. My MicroTrekker is painful to use, difficult to access, and doesn't carry more than a decent shoulder bag. Perhaps my difficulties are from the weight of the equipment that I carry, but if someone's only carrying light gear why not just use a shoulder bag? The compromised access of this backpack just isn't worth its carrying capacity. Other people disagree, which I completely understand, but I'm wracked with guilt at the thought of selling this bag because of the pain and suffering that it could cause some other photographer. When you see a craigslist ad specifying that the buyer must be under 5'6", you'll know who placed it. Updated November 2009: I've since passed the Micro Trekker along to another photographer, who is very happy with it. There's a good reason why there's so much diversity in the type and size of camera bags available, and there's equally good reason to make sure that the one you're buying is the best one for you. Trying them in person, loaded with the gear that you'll be carrying, is far more revealing than any number of hours spent reading about them.